That’s how Buddy GO was born, a fully-functional, Docker based version of Buddy with exactly the same (and a few extra) features as the cloud version and a dedicated support for GitHub Enterprise and GitLab self-hosted. If you’re a Buddy GO user, here’s a couple of things you might want to know. We’re currently working on Sandboxes that will allow you to run apps without the need of setting up a server. Since we announced the Beta two weeks ago, we have received numerous requests about its availability on Buddy standalone. We do confirm that Sandboxes will be available on self-hosted, just like every other feature of the cloud version. At the same time, we’d like to invite all standalone users to a private beta. If you’re interested, drop an email to sandboxes@buddy.works with “standalone” in the subject. When the beta rolls out, we will activate the feature on your machine. As cool as Buddy GO might sound, we needed a more universal name that will be immediately ring a bell for new users about the nature of the tool. 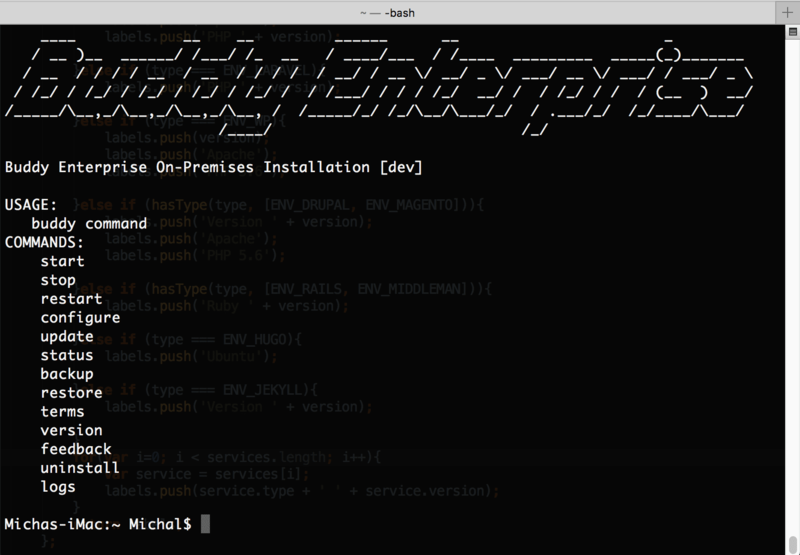 We’ve decided to go for Enterprise, an industry standard when it comes to naming on-premises software installations. The change is purely cosmetical and doesn’t require any action from your side.